Provide comfort for the family of Warren Wright with a meaningful gesture of sympathy. 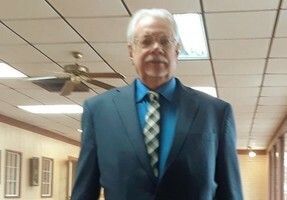 Wilson - Celebration of Life services for Warren Gene Wright, 70, of Wilson are scheduled for 2:00 PM Sunday, March 31, 2019 at Alexander Gray Funeral Home Chapel with Rev. Mark Fuller officiating. Cremation arrangements are under the care of Alexander Gray Crematory. Warren was born Sept. 14, 1948 at Duncan to the late Mr. Everett Laver Wright and Mrs. Jewel Jean (Bratton) Wright. He went to his heavenly home on Wednesday afternoon March 27, 2019 at the Veterans hospital in Oklahoma City. Warren was raised in Wilson graduating from Wilson High School in 1966. He was drafted into the U.S. Army on Nov. 30, 1966 and served 1 tour in Vietnam as a crypto teletype operator and later as a helicopter machine Gunner. He received his honorable discharge on August 26, 1968. He returned to reside at Oklahoma City and then later in New Mexico where he worked in the oilfield. He moved back to Wilson in 1994 and married the former Brenda Sue (Sparlin) Murphy on June 18, 1996 at Gainesville, TX. Warren always loved playing the drums. He played and performed with numerous bands and currently was the drummer for the " Ole Troubadours" and the "Country Wranglers". He was a member of the First Baptist Church of Wilson where he often played drums during worship. Survivors include his loving wife Brenda of the home in Wilson; stepdaughters, Amanda Thompson and husband Kent of Wilson and Victoria Arnold and her husband Randall of Enos; grandchildren, Soraya and Dillon; friend who was more like a brother, Johnny C. Turner and wife Angela of Wilson; other special friend, John David Smith of Lone Grove and all of his band members who are all like family. To send flowers in memory of Warren Gene Wright , please visit our Heartfelt Sympathies Store. Provide comfort for the family of Warren Gene Wright by sending flowers. I am sorry for your loss. God is close to the brokenhearted. Those in God's memory will live again.